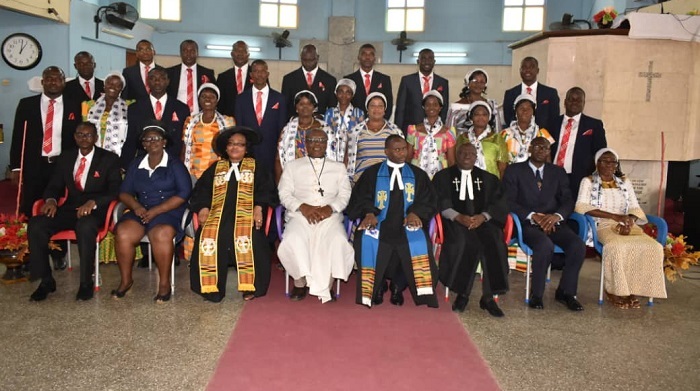 The Presbyterian Church of Ghana, Nativity Congregation at La in Accra yesterday inducted 23 newly elected presbyters into office to serve the church for a four-year term. The presbyters, comprising 13 men and 10 women, were nominated, vetted and voted into office by the congregation per the constitution of the church to form the session from 2019 to 2023. The new presbyters include Benjamin Anang Sowah, Edwin Tetteh-Bio, Elliot Yemoh, Edmond Mensah Yemoh, Laud Tetteh Baddoo, Joseph Sai Anum, Samson Sowah Mensah, Walter Adjetey Lomo, Seth Korlai Clottey, Ebenezer Tei Quarcoo, Godwin Dodoo, Ebenezer Akpor Sowah and Frederick Neils Hesse. The rest are Leticia Suekai Kumah, Docia Adjekai Clottey, Dinah Djamah Asumang, Dinah Djamah Mannieson, Naa Adjeley Klufio Larsey, Irene Atswei Odamtten, Mavis Merley Apau, Cynthia Anakmafio, Rebecca Ofosua Onyame and Florence Ago. During the induction, Rev. Prof. B.A. Ntreh admonished them to be steadfast in their work. “The task ahead is not an easy one. Presbyters are called to be disciples to help the minister to build the church,” he said. “Let your lifestyle be an example to the younger generation to follow. You are called by God to lead. God gave the congregation the wisdom to elect you for this cause; read the Bible and apply the word,” he concluded. Rev. Daniel Lankai Lawson, the resident minister and his assistant, Rev. Florence Kookailey Alabie Akwetey took the presbyters through the oath of office and offered prayers for them.